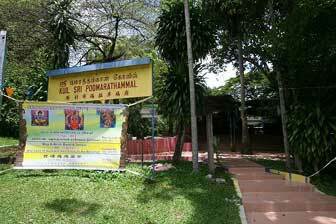 The Sri Poomarathammal Temple is a small Hindu shrine in Gelugor. It is located on a hill slope overlooking Jalan Sultan Azlan Shah. As with many of the Hindu shrines in Gelugor, it was founded by the Indian community who lived in the area and tended their cattle in the hills of Gelugor. Today, only pockets of the Indian community remains in Gelugor, in places such as Kampung Buah Pala. As Penang continues to be developed, the rural life of the Indian community today faces change. Nevertheless the Sri Poomarathammal Temple stands as one of the remnants of the community that was once predominant in the area.